and knitted my seventeenth & eighteenth socks of 2011. Comment with a personal highlight from SEPTEMBER below, to enter the Year Of Stash Socks giveaway. You could win a pair of hand-knit socks! 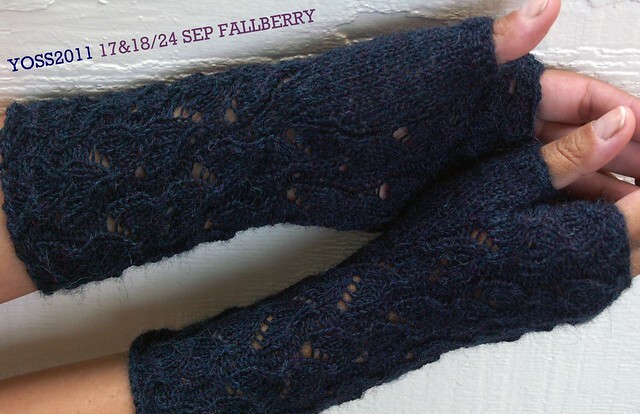 You are probably sick of seeing these Fallberry fingerless mitts, but it's a lovely pattern and it knits up much quicker than a pair of socks. These may turn up as someone's Christmas gift. This time I used a fabulously soft and rich midnight blue (blueberry) Ultra Fine Alpaca by Berroco. I've really enjoyed hearing your monthly status reports. Keep them coming. This giveaway is on the home stretch!